Keep it simple. Don’t make things more difficult than they should be. Just get it done! Good Mumblechatter today. Thanks for everyone that got up extra early! Keep Micah in your prayers. THE SCENE: Calm and 65. Be intentional with time with your spouse. Often we can let kids and schedules get in the way of that. The relationship with your spouse was there before kids, and God willing the relationship will be there when the kids move out. God created marriage first then children came. Date Your Spouse! PAX worked hard, and enjoyed lots of chatter about Chick-Fil-A (and now I am hungry). Perform exercises at each of the 4 corners of the turf field in multiples of 7. PAX stay together and run to each corner. Mix of plank, Al Gore, and Flutter Kicks while waiting for PAX to catchup on runs. Lots of good variation options with this workout. The 40+ crowd worked hard this morning and it felt great. THE SCENE: Almost 60 degrees – just warm enough to push us on the first decision of the day: short sleeve or long sleeve for the post. Light rain on/off throughout- which to my knowledge was unforecasted. 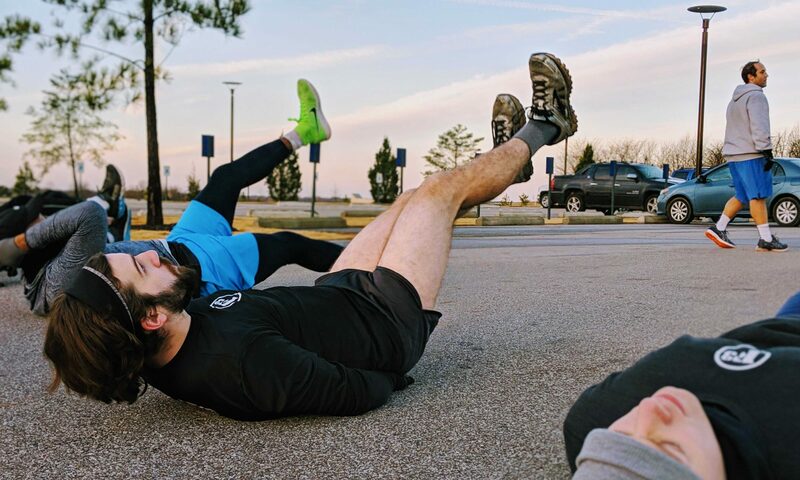 While one partner did Hurpees, the other did 10 yards of fast-feet toe-taps down a parking space line followed by a 15-yard sprint. Jogging back, they switched with their partner. Rinse/repeat for 3 min. Next exercise – while one partner did BBSUs, the other did 10 yard shuttle run followed by a 15-yard sprint. Jogging back, they switched with their partner. Rinse/repeat for 3 min. Next exercise: Ronaldo. With a modified soccer field outlined with cones, we partnered up and did a series of sprints and jogs from cone-cone in a seemingly chaotic fashion for 3 min. We could definitely tell which PAX were familiar with a soccer field and which weren’t. Exercise: Ball Boy. We lined up on the side court along the doubles-line and while one partner did Merkins, the other did a 10-count (1 is 1) Mountain Climber and finished with a sprint across 2 courts. Jogging back, they switched with their partner. Rinse/repeat for 3 min. Although we might have gone over 4 minutes as my watch was paused! Next Exercise: Pete Sampras. We lined up on the back of the court by the fence and while one partner did jump squats, the other did a 3-rung ladder sprint with a back-pedal: sprint to baseline and back-pedal to fence, then sprint to service area line and back-pedal to fence, and finally sprint to the net and back-pedal to fence. Switching with our partner, we did a quick rinse/repeat for 3 min. Exercise: Hank Aaron with a modified Charlie Hustle. We hovered around home-plate and while one partner did LBC’s, the other sprinted from home to first base and jogged around the rest of the bases back to home. Partners switched and they did the same. Partners switched again and this time we sprinted from home to second base, then jogged the rest. Rinse/repeat until both PAX finished with a full sprint around all the bases. Provided some perspective on sports and the impact of those on my life, family, relationships, etc. As a sports-themed workout, it’s interesting to see key sports figures and expression of their faith – giving all the glory to God for their abilities. Athletes all over the world use their God-given abilities and give Him the glory. Football players like Tebow that started a movement in Denver by getting down on one knee, athletes like Steph Curry or Russel Wilson – who are open about their faith. Curry has his favorite verse on his shoe: Philippians 4:13 – I can do all things through Christ who strengthens me. In whatever you do, give God all the glory. Work, family, athletics, parenting, etc. God has a plan for us all – so don’t spend our time worrying, instead spend our time giving Him the glory. Thoughts and prayers and focus on lifting up Motel 6’s frat brother, Randy. Need more PAX for the Crucible tomorrow! Proverbs 12:24 – Work hard and become a leader, be lazy and never succeed. Shared message regarding complacency. New job Utah received was not out of necessity but desire to continue personal growth. Don’t be afraid to take on new challenges, even if it makes you uncomfortable. God didn’t create you to be idle. First Q for me today, was nervous about it all week and spent alot of time planning. Great feedback from the guys, they looked gassed after all the running so my job was complete. Good luck in the Crucible fellas. Grabbed the CMU’s, hit the baseball field. Lined up on the left field foul line. We talked about doubt, inadequacy, and sin great enough to make us feel we cannot approach God. How these feelings are not from God, but from the devil. Encouraged PAX to reach out to anyone present if they are struggling with anything preventing them from a relationship with God. We should all be working towards a better version of our self. Think of where you need to improve and get to work. I am grateful for all of the PAX that have helped me grow in 2018 and years to come. All of the PAX pushed through the workout and encouraged each other. It was good to see 1040 in the gloom for the ruck and BC! Congratulations to Utah for his new job. Cool to see Hacksaw rucking his way back home from BC. Good work Men!!! !